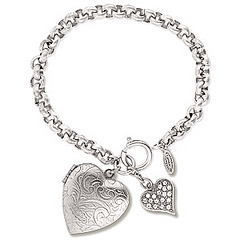 When you put on a Tiffany’s bracelet, which way should the heart face? Am I supposed to lay the heart face up with the bottom towards my fingers and then clasp it? I seem to be having a little trouble getting it clasped that way and I was wondering if there’s some sort of unspoken rule I’m unaware of lol Either way it looks fine to me and it just seems easier to do it the other way. The pointed part needs to be facing you.